Win Strictly Board Game & DVD Package! Calling all Strictly fans! We've got some fab-u-lous prizes for 10 lucky winners! 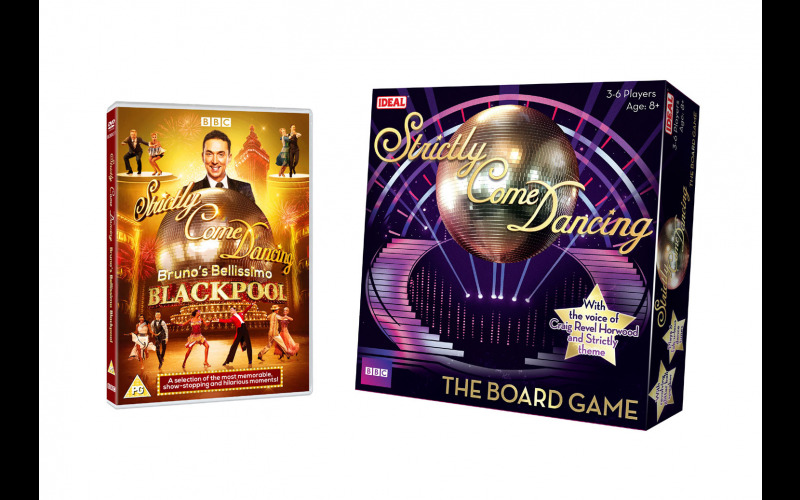 Each winner will receive a Strictly Come Dancing: The Board Game as well as a copy of Bruno’s Bellissimo Blackpool DVD, which celebrates some of the most remarkable Strictly routines ever performed in the illustrious Blackpool Tower Ballroom. Based on the much-loved TV treasure, Strictly Come Dancing: The Board Game is ready to make family games nights fab-u-lous this Christmas! Capturing all the excitement of the popular BBC show, players pair with an in-game professional dancer and journey through training by answering trivia questions, taking on fun challenges and performing mini dance offs. The two players that make it to the game’s ‘live final show’ can perform a dance to one of the six tunes that are played on the revolving glitterball speaker, or take on the finger Cha Cha challenge. Fellow competitors vote and the voice of Strictly Judge Craig Revel Horwood gives a score from the glitterball speaker; the finalist with the most votes wins the game! Whether you’re “a dance disaster, darling” or an aspiring ballroom beauty, Strictly Come Dancing: The Board Game is the perfect addition to your Saturday night in. Winners will also receive a copy of Bruno’s Bellissimo Blackpool DVD. This feature length special is packed full of some of the most show-stopping and hilarious moments in the history of Strictly Come Dancing’s much-loved Blackpool episodes, with Bruno at the helm sharing some of his personal favourite dances from the past 15 years, including performances from Jill Halfpenny, Harry Judd and Ed Balls.